One of the many good things about Justin P. Lange’s debut feature THE DARK is the way it subverts expectations twice in the first 20 minutes, yet doesn’t make a big deal about it. There’s a matter-of-factness about the way Lange pulls a reversal of a horror-film standard, then deftly switches the story focus, that bespeaks true self-assurance in his material and his abilities. 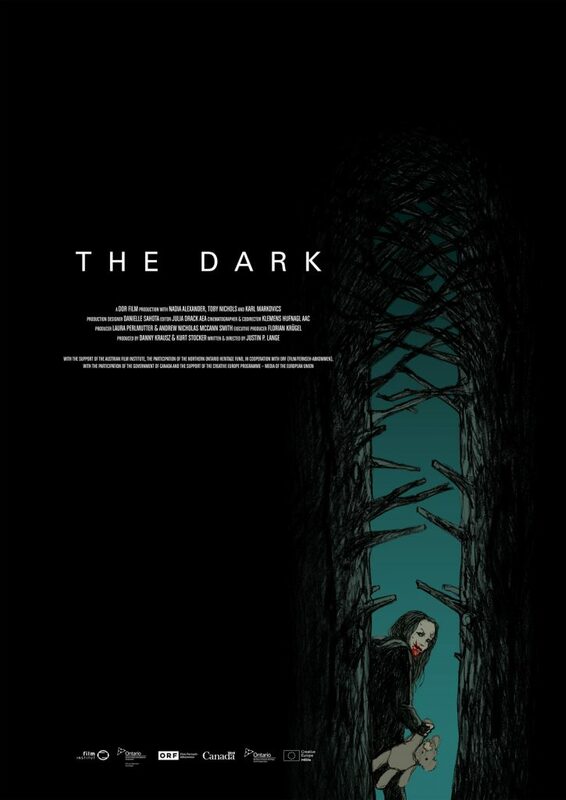 THE DARK, a world premiere at the current Tribeca Film Festival, joins festmates CARGO (reviewed here) and THE NIGHT EATS THE WORLD as films about undead people that are more concerned with character than carnage. Making this one unique is that the central role is a resurrected person, and the traditional contagion is not the reanimating agent. Mina (Nadia Alexander) is a teenage girl with a bloody, badly damaged face dwelling in a forested area known to the locals as Devil’s Den. There are hints of supernatural forces at work amidst the trees, though Lange wisely doesn’t explicate the details. It’s enough that we know some unearthly force brought Mina back, and that prior to her return, she didn’t die quietly or well. Yet while it’s uncompromising in its treatment of the living (some more innocent than others) who cross Mina and Alex’s paths, there’s a deep humanity at work in Lange’s sympathetic treatment of his heroine. The more we learn about what she’s been through in the past, the more we can understand her violent actions in the movie’s present. At the same time, Lange avoids one easy and expected catharsis, which serves to deepen the tragedy of Mina’s story and elevates THE DARK above a simple revenge-from-beyond-the-grave shocker. Alexander, who won Tribeca’s Best Actress award last year for the high-school drama BLAME, deserves more accolades for this performance; she blends a savage survival instinct with sensitivity in a way that allows us to fear her and fear for her at the same time. Nichols similarly eschews sentimentalizing Alex, who has given up on the possibility of life as anything but a victim, and could head down either a darker path or a lighter one once he crosses paths with Mina. Cinematographer Klemens Hufnagl (also credited as co-director) assists Justin P. Lange in suffusing THE DARK with many shades of black and grey, bestowing a moody atmosphere that perfectly complements its tale of death and resurrection—both physical and spiritual. The former is also expressed in subtle but meaningful ways via the prosthetic effects created by MastersFX and Zane Knisely. THE DARK brings true heart to the horror genre, while providing just enough of the blood and guts to keep harder-core fans satisfied.